Dreaming up nanostructures that have desirable optical, electronic, or magnetic properties is one thing. Figuring out how to make them is another. A new strategy uses the binding properties of complementary strands of DNA to attach nanoparticles to each other and builds up a layered thin-film nanostructure through a series of controlled steps. Investigation at the U.S. Department of Energy Office of Science’s Advanced Photon Source has revealed the precise form that the structures adopted, and points to ways of exercising still greater control over the final arrangement. The idea of using DNA to hold nanoparticles was devised more than 15 years ago by Chad Mirkin and his research team at Northwestern University. 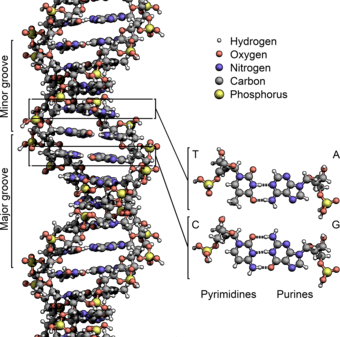 They attached short lengths of single-stranded DNA with a given sequence to some nanoparticles, and then attached DNA with the complementary sequence to others. When the particles were allowed to mix, the “sticky ends” of the DNA hooked up with each other, allowing for reversible aggregation and disaggregation depending on the hybridization properties of the DNA linkers. Nanoparticles linked by complementary DNA strands form a bcc superlattice when added layer-by-layer to a DNA coated substrate. When the substrate DNA is all one type, the superlattice forms at a different orientation (top row) than if the substrate has both DNA linkers (bottom row). GISAXS scattering patterns (right) and scanning electron micrographs (inset) reveal the superlattice structure. No image credit. Recently, this DNA “smart glue” has been utilized to assemble nanoparticles into ordered arrangements resembling atomic crystal lattices, but on a larger scale. To date, nanoparticle superlattices have been synthesized in well over 100 crystal forms, including some that have never been observed in nature. However, these superlattices are typically polycrystalline, and the size, number, and orientation of the crystals within them is generally unpredictable. To be useful as metamaterials, photonic crystals, and the like, single superlattices with consistent size and fixed orientation are needed. Northwestern researchers and a colleague at Argonne National Laboratory have devised a variation on the DNA-linking procedure that allows a greater degree of control. The basic elements of the superlattice were gold nanoparticles, each 10 nanometers across. These particles were made in two distinct varieties, one adorned with approximately 60 DNA strands of a certain sequence, while the other carried the complementary sequence. The researchers built up thin-film superlattices on a silicon substrate that was also coated with DNA strands. In one set of experiments, the substrate DNA was all of one sequence – call it the “B” sequence – and it was first dipped into a suspension of nanoparticles with the complementary “A” sequence. When the A and B ends connected, the nanoparticles formed a single layer on the substrate. Then the process was repeated with a suspension of the B-type nanoparticles, to form a second layer. The whole cycle was repeated, as many as four more times, to create a multilayer nanoparticle superlattice in the form of a thin film. 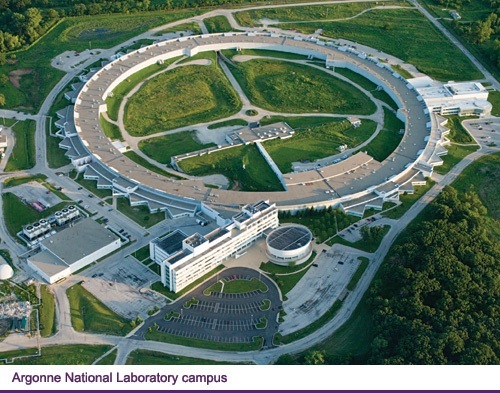 Grazing incidence small-angle x-ray scattering (GISAXS) studies carried out at the X-ray Science Division 12-ID-B beamline at the Argonne Advanced Photon Source revealed the symmetry and orientation of the superlattices as they formed. Even after just three half-cycles, the team found that the nanoparticles had arranged themselves into a well-defined, body-centered cubic (bcc) structure, which was maintained as more layers were added. In a second series of experiments, the researchers seeded the substrate with a mix of both the A and B types of DNA strand. Successive exposure to the two nanoparticle types produced the same bcc superlattice, but with a different vertical orientation. That is, in the first case, the substrate lay on a plane through the lattice containing only one type of nanoparticle, while in the second case, the plane contained an alternating pattern of both types (see the figure). To get orderly superlattice growth, the researchers had to conduct the process at the right temperature. Too cold, and the nanoparticles would stick to the substrate in an irregular fashion, and remain stuck. Too hot, and the DNA linkages would not hold together. But in a temperature range of a couple of degrees on either side of about 40° C (just below the temperature at which the DNA sticky ends detach from each other), the nanoparticles were able to continuously link and unlink from each other. Over a period of about an hour per half-cycle, they settled into the bcc superlattice, the most thermodynamically stable arrangement. GISAXS also revealed that although the substrate forced superlattices into specific vertical alignments, it allowed the nanoparticle crystals to form in any horizontal orientation. The researchers are now exploring the possibility that by patterning the substrate in a suitable way, they can control the orientation of the crystals in both dimensions, increasing the practical value of the technique.